PDF Download provide number of ways to convert and save webpages into PDF format. We have already seen Addons and pluginsÂ for Internet Explorer and Firefox for Web to PDF conversion. Here is more easy option to convert Webpages and save them as PDF format without any need to install any plugin or software. This is possible using ‘save page as PDF’ bookmarklet link in your browser’s Bookmarks toolbar or favorites. Just drag and drop the bookmarlet and you are all set. Internet Explorer users, right click on ‘save as PDF’ link and then click Add to Favorites. Select ‘Links’ folder from drop down next to ‘create in’ option and click on add button. 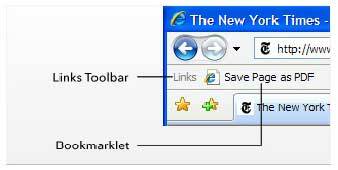 Firefox, Google Chrome and Safari users can simply drag the link to their bookmarklet bar. To use, while browsing any website click ‘Save page PDF’ button and you will get PDF version of webpage with original images, links and placement.Â Grab your bookmarklet here with demo video.